It help to support for joint, immune, skin, mental & heart health for men, women and children. 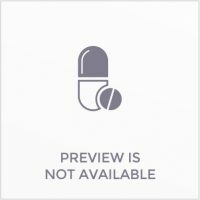 “Products Name : INLIFE Vegetarian Omega 3 DHA Algal Oil Supplement 400 mg Per Serving – 60 Liquid Filled Vegetarian Capsules. Pack Size : 60 Liquid Filled Vegetarian Capsules. 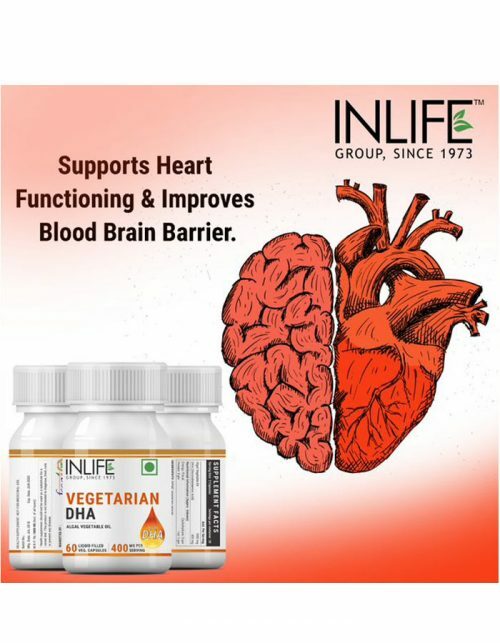 100% VEGETARIAN DHA SUPPLEMENT. Inlife Vegetarian Omega 3 DHA is fish free, mercury free and specially formulated for vegetarians (even the capsule is vegetarian) and health conscious consumers in mind. Vegetarian Omega-3 is a fatty acid product sourced from marine algae for vegetarians to boost of Omega-3 support for joint, immune, skin, mental & heart health for men, women and children. 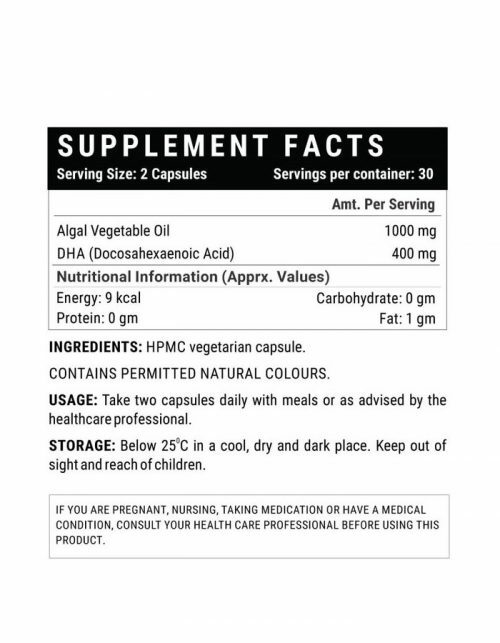 Each serving contains 1000 mg of Algal Oil that offers 400 mg DHA. SAY GOODBY TO FISH BURPS! Inlife Vegetarian Omega 3 DHA, eliminates the fish burps. Whether you can¢t eat fish or worry about the toxic substances in fish, people all over the world are shifting to Omega-3s from Algal oil. Fish get their omega-3s by eating algae. You get a boost of pure Omega 3 fatty acids from the same place as fish get theirs. HEALTH BENEFITS: Omega 3 deficiency corrupts your body¢s inflammatory signalling which produces chronic inflammation. Out of balance omega ratios are a cause of many health conditions. 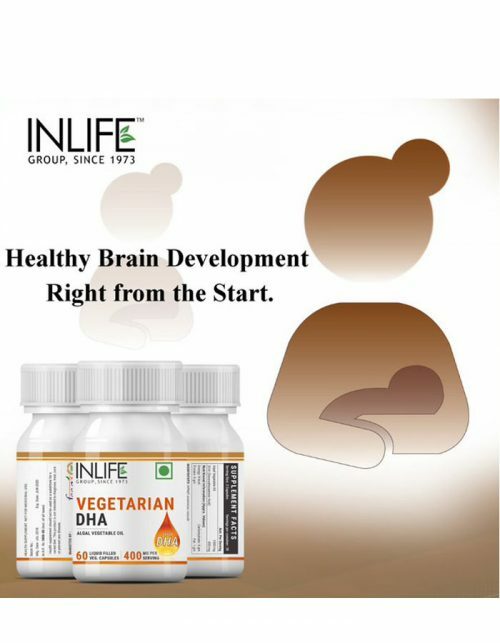 DHA is good not just for your baby but also for you. Science has shown that DHA can support cognitive health. Omega-3 fatty acids help reduce inflammation and can put the body in a conducive state of healing. LIQUID FILLED VEGETARIAN CAPSULES: Algal oil is encapsulated in liquid filled hard shell vegetarian capsules that are having many advantages over soft gels. It does not contain gelatine, are stable in hot climates thereby do not stick together and become gluey like soft gelatine capsules, will disintegrate faster due to the capsule wall being 5 times thinner than the walls of soft gelatine capsules, less product migration into the shell, less diffusion of odours. PURITY: Inlife Vegetarian Omega 3 DHA contains the most natural and effective formulation of trusted natural ingredients that are carefully processed and manufactured in a GMP­ certified manufacturing facility so you can be sure that you’re safe.